For the third bookmarked recipe, I have chosen to highlight these waffles which the kids would love to have as an after school snack. Here I have chosen to use up the frozen tater tots from my freezer. But I am sure grated potatoes with appropriate seasoning can be spread on the waffle iron to make these crispy waffles. As such there is no recipe but the idea of using tater tots in a waffle form appealed to my kids. Grease the waffle iron, arrange the frozen tater tots on the waffle iron. Close the lid and let the waffle maker do the magic. Serve with a dipping sauce of your choice. Check out the Blogging Marathon page for the other Blogging Marathoners doing this BM#90. Here is a delightful and healthy breakfast/snack which is addictive as well. When I got a pack of buckwheat a few months back, I tried out various dishes with buckwheat and one of my personal favorites has been this paniyaram paired with moong dal. Wash and soak moong dal and buckwheat groats overnight. Grind the soaked moong dal and buckwheat groats into a fine batter adding ginger, green chilies and coriander leaves. Soak idli rava in about 1 cup of water for about 15-20 minutes. Squeeze excess water from idli rava and mix it into the moong dal batter. Add crushed almonds, salt, cumin seeds and grated coconut to the batter. Mix the batter well and adjust the salt if needed. Heat the paniyaram pan with a few drops of oil in each slot. Pour a tablespoon of batter in each slot, cover and let it cook for a few minutes. After the undersides are cooked, flip them carefully allowing them to cook on the other side as well. Remove and continue with the batter. Serve them warm with a chutney of your choice. This week I shall post some bookmarked recipes or recipes close to my heart. I have been making this Tomatillo-bell pepper chutney for over a decade or more. We love the tart tomatillos in dal, salsa and chutneys. In a skillet on a medium-high flame, Pour oil and the rest of the seasoning ingredients. After the mustard seeds splutter and the rest of the dals are golden brown, add the chopped tomatillos, colored bell peppers and chopped green chillies and saute them. After stirring for about 3-4 min, add salt, roasted sesame seeds, coconut powder, almonds / roasted peanuts and sugar, mix well and let the vegetables get mushy. Remove from fire and add the chopped garlic and mix well. Let the mixture cool down and then grind it to a coarse paste adding cilantro as needed. Enjoy it with steaming rice and ghee. Some like it with Idli or Dosa. Check out the Blogging Marathon page for the other Blogging Marathoners doing this BM#90..
My kids are fond of pasta in all its variety and when they saw this in the social media feed, they were after me to make this. To convince me that they would eat it without any complaints, they went grocery shopping all by themselves to buy the required ingredients. Boil 2 liters of water with enough salt and add the spaghetti. Cook as per the instructions on the box. While the spaghetti is cooking, get the pesto ready. Also get the vegetables steamed and seasoned to taste. Grind the ingredients listed under 'For the Pesto' into a fine paste. Remove the boiling spaghetti from heat. Reserve about 2-3 tablespoons of the starchy water. Drain the spaghetti into a colander. Transfer the spaghetti into the pan and mix in the pesto. Serve the warm green pasta and top it off with fresh mozzarella, steamed vegetables and salad greens. For today, I have a simple assortment of dishes. My older one prefers to be able to pick from an array of dishes whereas I prefer just dal, sabji and rice for comfort food. In a heated pan, add oil and saute onions until golden brown. Add in the cloves and cinnamon, ginger-garlic-green chili paste and tomatoes. Cook until the tomatoes are mushy. Remove from heat. Make a smooth paste of the mixture adding cashews and milk as needed. Get the pan back on medium heat. Add butter and cumin seeds. Add the smooth gravy, cover and allow it to simmer for 2-3 minutes. Add in the carrots and peas. Sprinkle Garam Masala, Dhania Powder, Red Chilli Powder, Salt and Turmeric, Kasuri Methi as needed. Adjust the consistency by adding more milk. I like to add a little sugar as well. This week I shall showcase some everyday lunch/dinner platters which are not so elaborate and sometimes just make-do kind of meals. Here I have this rich and creamy gravy with an unusual vegetable, Ridge gourd or Turai or Beerakaya. A lot of times, my lunch consists of Roti, sabji and a little bit of yogurt rice or Carrot Raitha. Though the picture doesn't show raitha, my meal is never complete without yogurt in some form. In a heated pan, add oil and roast coriander and cumin seeds. Add the sesame seeds and green chilies. Roast for a few seconds. Add in the onions. Saute onions until they are translucent. Add tomatoes and allow them to cook until mushy. Remove from heat. Grind the above mixture, adding tamarind extract and roasted peanuts, to a fine paste. Set aside. In a heated pan, add oil and the rest of the seasoning. After the mustard seeds pop and the dals are golden brown, sprinkle turmeric and transfer the chopped beerakaya. Mix well, sprinkle salt and cover. After about 5-6 minutes, when the ridge gourd is cooked through, pour the gravy with as much water as needed. Sprinkle red chili powder as needed. Let the gravy simmer for 3-4 minutes. Remove from heat. Serve with Roti/Rice. 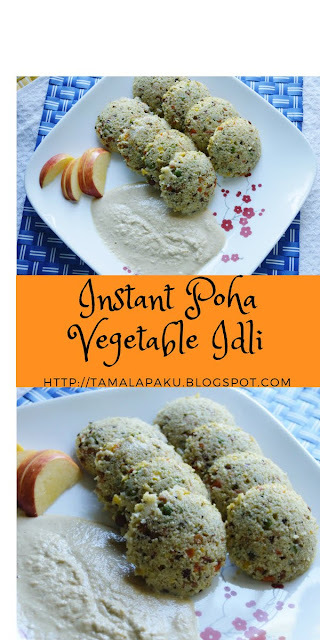 To conclude this month's series 'Instant dishes', here is a personal favorite. 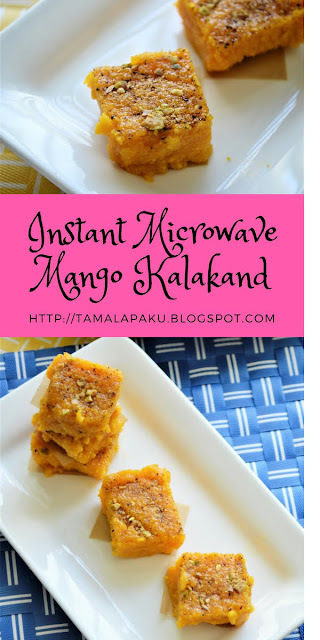 This version of kalakand is a great way to enjoy the last few mangoes of this season. I remember my mom slogging in front of the stove to make kalakand the old-fashioned way. Now when it is my turn to make it, I always look for easy and quick ways to enjoy such treats. My family and friends enjoyed this mango kalakand. *I used homemade soft paneer from 1 liter low fat milk (2%). Store bought grated paneer can also be used. In a microwave safe deep bowl, add the mango pulp and microwave in high power for 3 minutes. Remove, mix and add in the soft paneer and milk powder. Whisk well and zap for another 2 minutes. Remove, mix and cook for 2 more minutes. Remove, add condensed milk, mix and cook for 5 more minutes in 1 minute intervals. Make sure the mixture doesn't overflow. When the mixture is semi dry and looks grainy, it is done. Ensure that it the mixture is not totally dry. Transfer the mixture onto a greased container. Pat it evenly. Sprinkle the cardamom powder and chopped nuts. Allow it to rest/cool for a few minutes. We are all fond of masala vada dunked in sambar, right? Imagine you have a craving to eat masala vada on a rainy day, but there is no readymade batter available on hand. Then this instant version is a life saver. These vadas turn out crispy and are very addictive. I am always skeptical about using bread in a deep fried dish and have an inherent fear that the dish would absorb excess oil. But in this case I didn't observe anything of that kind. Roughly tear up the bread slices and pulse to make a coarse powder. In a mixing bowl, add the powdered bread, sooji, rice flour, onion, ginger, green chilies, coriander leaves, cumin seeds, chili powder and salt. Mix well and knead into a stiff dough slowly adding curd as much as needed. Pinch lime sized portions and shape them like a donut/vada and gently slide in a pan of hot oil. Let them fry until they are golden brown all over. Remove them onto paper towels to drain excess oil and continue with the rest of the dough. Serve hot as is or with any chutney. Check out the Blogging Marathon page for the other Blogging Marathoners doing this BM#88..
Do you freak out on weekday mornings when you realize you have nothing planned for the day's breakfast? Then today's post might come in handy. I have chosen to make some instant versions of some tedious/time taking dishes this week. For today's recipe, the instant idli mix can be made ahead of time and stored or it can be prepared (roasted and powdered) in 7-8 minutes. If there is not enough time, then the vegetables/seasoning can be omitted and just plain idlis can be made. But don't forget to add salt and baking soda/ENO fruit salt. In a heated pan, dry roast the poha and set aside. In the same heated pan, dry roast methi seeds and urad dal until it turns golden brown. Set aside to cool. Dry roast sooji in the same heated pan. After they cool, grind urad dal, methi seeds and poha to a fine powder. Mix in the roasted sooji. The instant idli mix is ready to be stored in an airtight container. When the idlis need to be made, take the required amount of the mix and follow the next steps. In a heated pan, add oil and the rest of the seasoning. After the mustard seeds pop and the dals are brown, add in the crushed almonds, coriander leaves and green chili. Add in the grated vegetables and saute for a few seconds. Add in salt and remove from heat. Let it cool for a few minutes. In the instant poha idli mix, add in the seasoned vegetables, whisk in yogurt and sprinkle baking soda or ENO fruit salt and gently mix. Divide the batter into a idli plate. Steam it for 15 minutes. Let it cool for a few minutes. Unmould and serve it warm with a chutney of your choice. Under the theme of Indian Regional dishes, here is my third one this month. I cannot pin this recipe to one particular state/region but can safely say it is from North India. In the picture the gravy doesn't look too smooth but trust me the gravy was rich and creamy when we ate it. I took the picture the after a few hours and by then the makhana were soggy and so the resultant picture. I shall definitely update these pictures as soon as I get to make this sabji. In a heated pan, dry roast the makhana until they are crisp. Remove and set aside. In the same pan, add a teaspoon of oil and saute onions until they are translucent. Add in ginger, garlic, and green chilies. Saute for a few seconds. Add in the tomatoes and cook them until mushy. Remove from heat, transfer into a blender and grind into a fine paste adding cashews and water as needed. Return the pan to heat, add 1 tablespoon of oil and cumin seeds. After the cumin seeds crackle, add the gravy paste. Add in the khoya and all the spices listed including salt and turmeric. Adjust the consistency by adding water as needed. Mix well and let it come to a boil and the gravy is ready when the oil floats. Add in the roasted makhana, cook for a couple of minutes and remove from heat. Garnish with chopped coriander leaves and serve warm with rice/roti/naan.